The N8 phone has a 12 megapixel camera and allows people to record and edit High Definition video clips, as well as watch web TV services. Analysts said the phone was a "pivotal device" in efforts "to make Nokia's high end phones credible again". It is also a chance for Symbian to prove itself alongside Google's Android operating system and Apple's iPhone. Despite being the world's most popular smart phone software, Symbian has lost "mindshare" against more high-profile software, according to industry experts. Analysts at CCS Insight described the Symbian 3 software as "evolutionary not revolutionary" but said it was a "key first step if it proves reliable". It is the first version of the software since the Symbian foundation announced that it had made its code open source in February. The Foundation - which includes Nokia, Motorola and Samsung amongst others - gave away the code to developers for free in the hope that it would help speed up the pace of improvements. Any organisation or individual can now use and modify it. The software in the N8 allows the phone to have multi-touch and multi-tasking, meaning more than one application can be open at any one time. The device will be Nokia's flagship smartphone. It can be plugged into home theatres and supports surround sound as well as high-quality video. Social networks, such as Twitter and Facebook, can be displayed on the home screen in a single application. 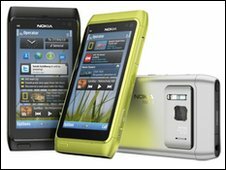 Lee Williams, executive director of the Symbian Foundation, said he was "stoked" that Nokia had chosen to use the operating system on its phone. The phone will ship in the third quarter of 2010, following delays.